Catenoy is a small village between Beauvais and Compiegne in the Oise region of France. Catenoy French National Cemetery is located to the North of the village on the D. 931. Catenoy French National Cemetery contains two Commonwealth burials of the First World War. 4th June 1918, aged 28. 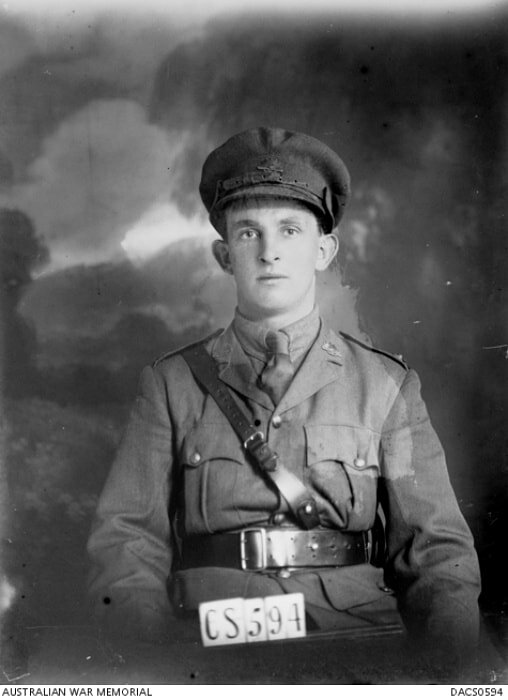 Studio portrait of Second Lieutenant (2nd Lt) Leslie John Primrose, No 4 Squadron, Australian Flying Corps. 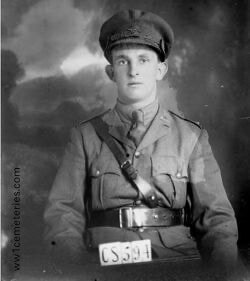 2nd Lt Primrose had initially enlisted with the rank of Private in the 10th Battalion. Following his promotion to Sergeant he underwent flying training and was promoted to Second Lieutenant and embarked with C Flight from Melbourne on RMS Omrah on 17 January 1917. Later transferring to No 2 Squadron, he was killed in action on 4 June 1918, aged 28, and was buried in the Catenoy French National Cemetery. This is one of a series of photographs taken by the Darge Photographic Company which had the concession to take photographs at the Broadmeadows and Seymour army camps during the First World War. In the 1930s, the Australian War Memorial purchased the original glass negatives from Algernon Darge, along with the photographers' notebooks. The notebooks contain brief details, usually a surname or unit name, for each negative. Original grave at Breuil-le-Sec Cemetery of Lieutenant Leslie John Primrose, No 2 Squadron Australian Flying Corps who was killed in action on 4 June 1918 aged 28. His remains were later moved to Catenoy French National Cemetery at the end of the war. Lieutenant Leonard Charles Welford, 80th Squadron, Royal Air Force, died 7th June 1918.